Our October 2018 basic box focused on ink. 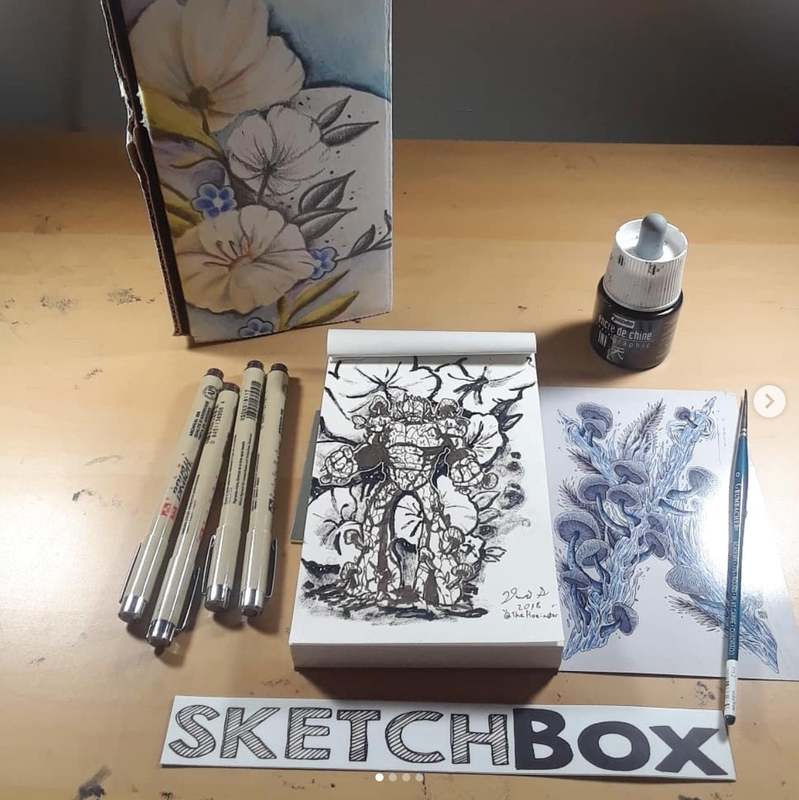 It included a 45ml bottle of Pebeo Graphic India Ink, a Grumbacher Academy round brush size 0, A full four piece set of Sakura Pigma markers (brush tip, .25mm micron tip, .45mm micron tip, and 1mm tip) in a beautiful sepia tone, and a Global Art Flexi-Sketch landscape 5x7" sketchbook. These supplies were specifically chosen to allow you to create beautiful ink illustrations. The 45ml bottle of Pebeo ink is extremely potent and will give you the ability to create hundreds of ink pieces. It washes out to beautiful grays with the addition of water. The sepia set from Sakura allows you to add a warm tone to your drawings and add detailed linework. The Grumbacher brush allows for finely detailed illustrations and a true command over the ink. Have fun and remember to tag your art with #sketchBox to be considered for our monthly contest. The winner gets their art printed on our boxes! This picture was taken by our talented subscriber @thehueinator - check out their art on instagram!